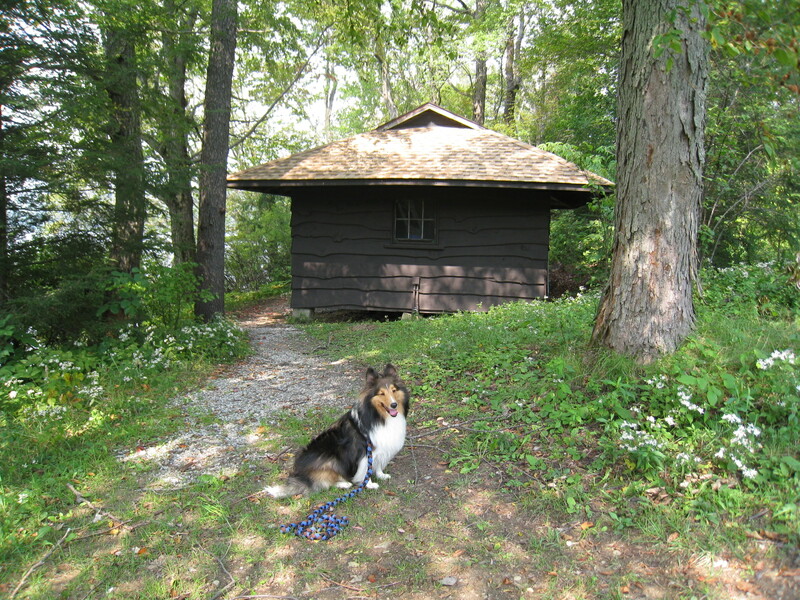 Over Labor Day weekend I gave a presentation on “Living With Dogs” based on my recently published book “There’s a Dog in the House” at Camp Unleashed in Becket, Massachusetts. It was my fourth Camp Unleashed. I attended the inaugural CU in 2004 with Teddy, both Teddy and Lena in 2005 and then once again with Lena in 2007. This time our Sheltie Quinn accompanied me. Camp Unleashed is a great experience for suitable dogs and I encourage everyone to take a look at what it has to offer. Teddy adjusted very well to camp and I was able to do many activities with him. Lena was totally exhausted by the last day and in hindsight I realized I should have minimized the number of activities we participated in. Having learned from this, my approach with Quinn was very different. I decided to let him determine what and how much we would do. Quinn is reserved around other people and dogs so I knew we would need to take it slow. I needed to monitor every situation and watch his response. Since Quinn and I already compete in agility I found he was most relaxed and confident in that arena. Group hikes were good if we stayed to the back or if the group size was small. 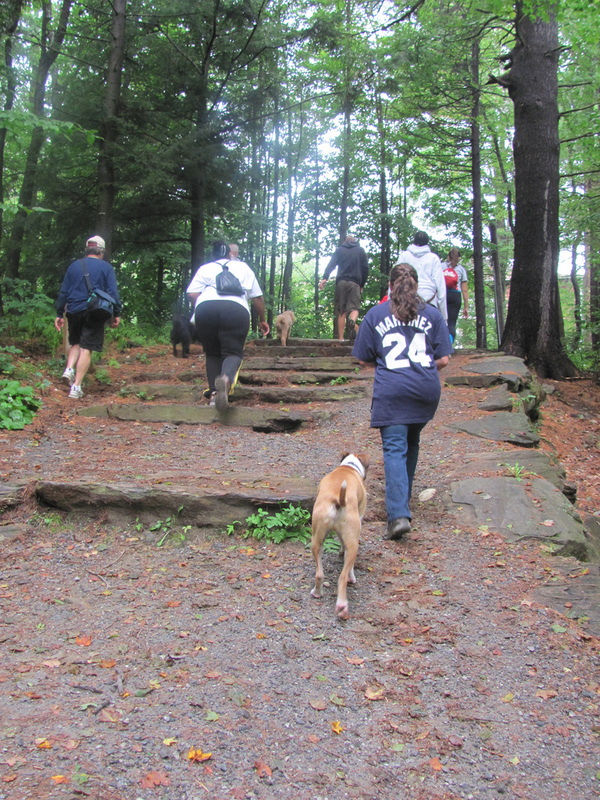 The best of these hikes was the Mindfulness Hike where owners were not permitted to talk to each other or their dogs. Wow, it was amazing. He was also fine in any group where the other dogs were less exuberant and boisterous, so we stuck to those groups. I found myself spending a lot of time walking him off leash by himself. While on these walks I would occasionally bring him closer to larger groups of dogs. We also spent time taking naps or just hanging out together. My strategy worked great and by the end of the weekend I found his confidence was stronger. Since coming home we participated in an agility class and agility trial where he was spectacular and confident! It’s too early to say, but I believe one key to this confidence was our weekend at Camp Unleashed. I think the most important lesson here is that you have to know your dog. Since they can’t talk directly to us, we must spend a lot of time with them to really understand them. This is true for working and competing with our dogs, and it is just as true for living with them. Design always begins with two questions: What does the client need? And – What does the client want? Needs are those things that are necessary. In a home it might be a place to eat, sleep or bathe. Wants are those things that might make a client’s life more enjoyable: a soaking tub, a fireplace, or a screened porch. It’s relatively easy to ask your client these questions but we can’t ask our dogs. What we can do is observe them, really study their behavior to truly understand what they need and want. This takes time, patience and it requires developing a strong relationship with your dog. While each of our dogs is unique we can also make judgments based on breed or type (i.e. hound, terrier, etc.) For example hounds were bred to hunt at a distance from their owner so they need to alert their owners through barking. This means they may have a greater tendency to bark than other dogs. These things are good to keep in mind as you begin to analyze and then design (or redesign) your living space. The other part to creating the best living experience for you and your dog is to analyze your home and your lifestyle. If you have an existing residence (this includes rentals too!) make a list of areas, components, and/or products that you think are dog friendly and those that are dog unfriendly. This could be different for different dogs. At Camp Unleashed we did exactly that with Gibson Hall, an older camp building, and I was impressed with the results. 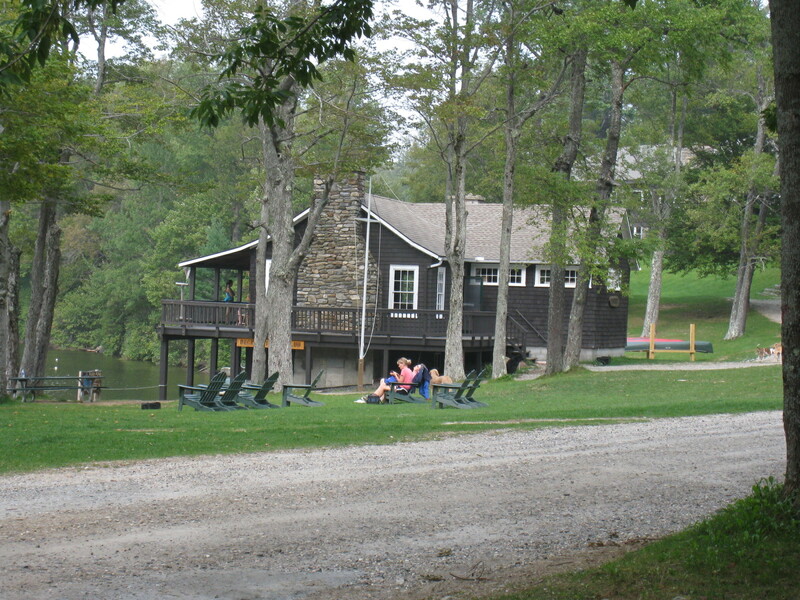 Gibson Hall is situated at the far end of camp on top of a small rise. The approach is on a trail through the woods or via a gravel road. The trail was what most campers used to arrive at the building and part of it consists of giant steps made out of stone. These steps were very difficult to negotiate because the rise was too high on each and the space between “treads” was too great. Along either side was a worn path, evidence that most campers chose not to walk those steps. Upon arriving at the base of the building one had to climb another set of awkward stone steps set in a 4 to 5 foot high formidable stonewall. These steps were inconsistent in height (rise) and depth (tread) and there was no handrail. In addition the rock wall did not having a railing. (see the photo) Both of these situations would not meet codes in most places. Many of the campers were staying in Gibson Hall by choice. It was the only accommodation that offered electricity and bathrooms in the building. One of the most interesting things was how the dogs that stayed there acted like they owned the building. I believe this was normal and natural behavior for them. When any of us approached with our dogs we were immediately greeted by an onslaught of dogs residing at Gibson and that was a startling thing for some dogs. This was the only building where this was true. It was probably due to the fact that so many dogs were staying there but I also believe that the difficult sloped approach to this building had something to do with it. Gibson Hall sits on that hill like a fortress! 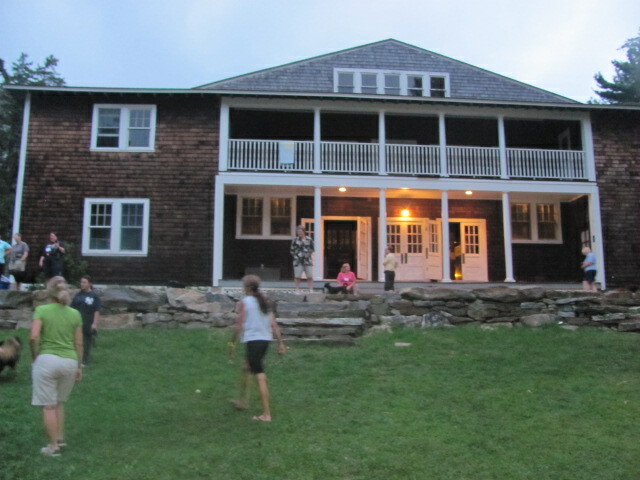 On the final night a camp talent show was held outside Gibson Hall on the terrace above the wall. By then, even Quinn had become bold enough to bark at latecomers arriving up that hill! Inside, Gibson Hall had a large central space or “hall” that extended through both floors to the roof. 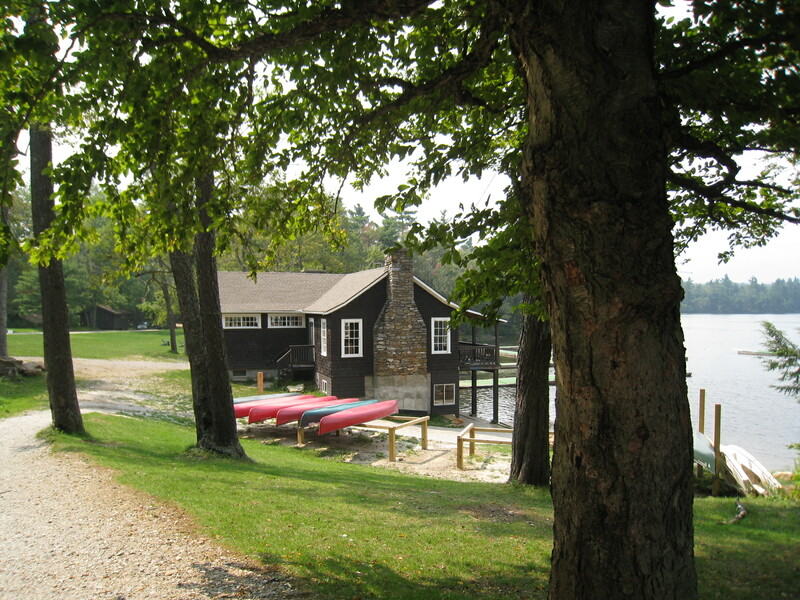 The “hall” was surrounded by camper bunk rooms and a few bathrooms. At one end of the “hall” was a stage with a fireplace. The lighting consisted of a series of very dim sconces around the perimeter. There was extensive stage lighting but the controls were not accessible. The interior finishes were almost entirely wood: floors, walls, columns, stairs and the ceiling. During my presentation, I divided the group into four groups and asked them to identify at least 5 dog unfriendly things about the building. I asked them to observe the space from the perspective of their dogs and many of them crouched down on the floor to experience what their dog might see from his or her vantage point. The list they created in five minutes was long and detailed. They did an outstanding job. Most of what we discovered related to safety and to nearly all dogs. The rest of the presentation focused on specific issues for campers and included everything from flooring materials to odor and stain removers. As you may know from the book or this blog, I tend to like hard surface flooring like wood or ceramic tile and strategically placed carpet runners or modular carpet tiles. FLOR carpet tiles are my favorite. We discussed some odor and stain removers, everyone has a favorite, mine is Nature’s Miracle (the original formula). I also use a mixture of white vinegar and dishwashing liquid to clean carpet odors and stains. I wash and rinse my FLOR tiles in a large sink. I have discovered a new stain remover completely by my own very unscientific experiment. One day I noticed that a rotten banana had left a dark and nasty stain on our wood countertops. Figuring that I had nothing to lose I poured some hydrogen peroxide straight from the bottle on it. Over a period of a few days I repeated this process. The stain completely disappeared. The countertop does have a finish on it but it’s a penetrating finish and not a hard finish. I tried a similar experiment on our finished wood floors to remove an old dog urine stain and had more mixed results. The hydrogen peroxide did manage to remove the stain but it also lightened the floor in that area. I will keep an eye on it to see if the floor will once again darken with age and let you know. If it works this could be an inexpensive and great solution to stains in wood. You are bound to create a stronger relationship with your dog and meet like minded people! This entry was posted in dogs and tagged Dog, dog camp, dogs, pets. Bookmark the permalink. Thanks for the suggestion. By the end of the weekend it didn’t seem to matter, it was only that first time to Gibson! Once the dogs adjusted it wasn’t a problem at all, which was a testament to how well camp worked. I did find it fascinating from my perspective as a designer and teacher – the things we learn from buildings can be interesting. I couldn’t help but wonder how the boys at camp handled this – whether the feeling was the same.